We believe dogs are family. They are weaved into our daily lives and our world is a shared place. Daily life includes our dogs, no matter the activity or the destination. We believe in nurturing this relationship. We honor the language of dogs. We value respecting them as our canine companions over anything else. For us a shared life is an inspired life. I want my dogs to live the best lives possible. They bring so much joy into our lives that providing the best care for them is an even exchange. I didn’t use to be like this. My first dog I was a normal “Pet Owner”. I basically attended to its food, water, and shelter. I went to the store, picked the prettiest looking dog food and fed my dog the kibble that was on sale. As I got older I evolved to become a “Pet Guardian”. I was interested in improved nutrition, grooming, the dog had free reign to the house, and I purchased toys from the local pet store. Now these girls didn’t come with a manual. And I with the plethora of resources available to us I’m just learning as I’m going. Here you’ll find us sharing what we’re learning and a ton of photos too. I consider myself to be Today’s Modern Dog Mom. 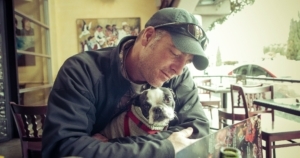 I thoughtfully think about their care and I am focused on nurturing our human-dog bond. I respect that we all come for varying backgrounds, with different lifestyles. And all I aim to do is … ask a little bit more … look at things from a different perspective in the care of our dogs. I love our community. I draw strength and friendship from it. We’re often walking with our local dog friends or co-hosting Dog Pack Walks. 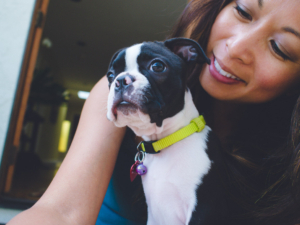 Zoey July 25 2011 to May 5, 2015: Our first Boston Terrier. 13 pounds in weight but she thought she was over 100 pounds of dog. Super alpha. Self assured and so affectionate at the same time. We were the original pack of three and she was the original gremlin. No longer with us on this earth but waiting for us when we get to heaven! 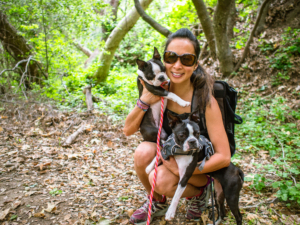 They are both Boston Terrier dogs residing in San Diego. Maggie at about 12 or 13 weeks. Zoey about about 16 weeks. 2010. Maggie and Orbit. Photo was taken May 2016. Hi! We’ll be getting our first Boston Terrier within a few weeks. I’ve been reading and follow you and the girls on IG. Any suggestions? products we should have before she comes home? I notice that you keep them on a specific diet, any tips for that? All the info will help!